We are a leading Manufacturer of 4 burner gas stove, 3 burner gas stove, 2.5 burner gas stove, two burner gas stove, gas stove and gas pipe regulator from New Delhi, India. Under the strict supervision of our experienced professionals, we are offering an innovative collection of General Aux 4 Burner Gas Stove. Designed for quick and uniform cooking, offered gas stove is availed in various sizes, designs and specifications for our clients to choose from. Our provided gas stove is precisely designed using the best quality components and modern technology at our vendor’s end. Apart from this, clients can avail this gas stove from us at pocket friendly prices. make products in factory ourselves. strong manufacturing capacity for OEM service. flexible production for tailor-made service to client. Optional : Other parts such as steel & glass panel, valve, ignitor etc. Backed by a team of creative and skilled designers, we are highly engaged in providing an excellent range of General Aux 3 Burner Gas Stove. Renowned for its corrosion resistance body and easy usage, this gas stove is designed using food grade components and advanced tools by our vendor’s professionals in compliance with industry norms. Widely used in homes, hotels and restaurants for cooking, offered gas stove is tested against various quality parameters in order to maintain its quality. Being a well-established organization, we bring forth an excellent assortment of General Aux 2.5 Burner Gas Stove. Our provided gas stove is praised by our clients for its high efficiency and smooth finish. Used at various places for making food, offered gas stove can be availed by our clients in diversified sizes, designs and specifications. Our provided gas stove is manufactured by vendor’s professionals utilizing the finest quality components and innovative technology. Our organization has a very modern and sprawling infrastructure which has all the latest and sophisticated facilities to provide beat-in-class Two Burner Gas Stove. Capable of cooking various dishes, offered gas stove is precisely manufactured by our vendor’s professionals from quality tested components and the latest technology in line with industry norms. In order to ensure its quality, we test this gas stove against various quality measures. 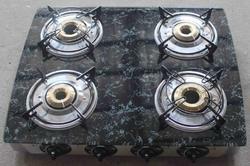 Besides, we offer this gas stove to our clients at budget friendly prices. High-texture oil mill brushed stainless steel panel, the distinctive and easy to clean, ouch of the dry. Under the ignition design, double ignition performance, instant light without the need to wait for the total elimination of ignition troubles. Accidental flame out protection, safe and reliable. Reliable in nature, these 2.5 Burner Gas Stove are safe to use up to several years. These burners are small in size and easy to use. In addition to this, these burners are made of rust proof metal. In addition to this, these burners are finely prepared with the use of best machinery. Additionally, these burners are heat proof. Designed with a toughened glass top and a rich matte steel body, this gas stove is durable, sturdy, rust resistant and easy to clean. With features like multi-directional gas inlet nozzle, rotary knobs and high-powered burners, this gas stove is safe and easy to operate.
. Gas Regulator suitable for Bharath Gas, H.P or Indane. . Gas Regulator is fitted on the gas cylinder to On/off the gas pressure. This regulators are made and checked under quality supervision before dispatch to consumers. . According to standard regulations issued by the petroleum agencies one must change its cooking Gas Regulator and pipe in every 3-5 year period is compulsory or there is a High risk of leakage and fire break out any time at your house and also one is under risk of account cancellation by the Gas company if its found one is using a older regulator or pipe than standards. Looking for Gas Stoves ?